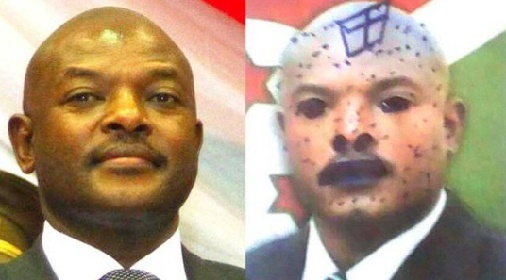 Authorities in Burundi have released three schoolgirls who were arrested and detained for allegedly defacing a picture of President Pierre Nkurunziza by scribbling on his image in textbooks following an international uproar. The country’s minister for justice, Aimée Laurentine Kanyana, told the state broadcaster RTNB that the girls had been given provisional release but future cases would result in prosecutions. “We call on parents to strengthen the education of their children. We remind children that they have to respect authorities, that the age of criminal responsibility is 15,” the minister said. A spokeswoman for the country’s Supreme Court had confirmed that the three girls were detained and a full trial would go on. They faced up to five years in prison if found guilty of the offence. An online campaign using the social media hashtag #FreeOurGirls saw users post pictures of the president defaced in various ways using clown wigs, twirly moustaches, pointy ears and bloody fangs. Human Rights Watch led the international calls to have the girls, aged 15,16 and 17, released with its Central Africa director, Lewis Mudge, urging the government to hold perpetrators of serious rights violations to account instead of jailing school children for doodles.